What a beautiful weekend we just had in Algonquin Park! Sunny and about 23C. 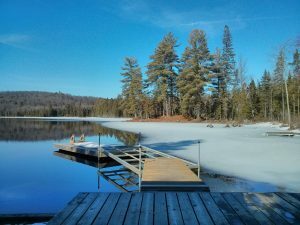 Warm enough for shorts, but not for swimming as there is still ice on lakes. Ours, which is river fed, was mostly ice free, and you could practically watch it melting. Definitely less on Sunday than there was on Saturday! Like most seasons at the Eco-Lodge, spring brings challenges and benefits. Mostly good stuff though! The nice warm weather, no bugs, flowers (still a bit early with the late start we had). And this year we found that an experiment we tried looks to be working. Last fall some guests, who happened to be farmers, told us that if we covered up our herb garden with polysheet before winter it would stay warmer and start growing a month earlier than normal. This weekend I scraped off the remaining snow and ice and was pleasantly surprised to find chives, thyme, and spring onions already growing! Should be a bumper crop! The challenges that spring bring are just dealing with the soggy ground, and flooding. We call this time of year “the season of mud”. Every time we drive into our parking lot we chew up the ground. So we have to park on the road and our 2.5km hike to the Lodge becomes a 5km slog! And even later, when the ground dries up enough that we can safely use our parking lot without causing any damage to the road, the gravel pit half way along the trails floods. The ice cold water can be up to your waist, so no way through until it drains or evaporates. 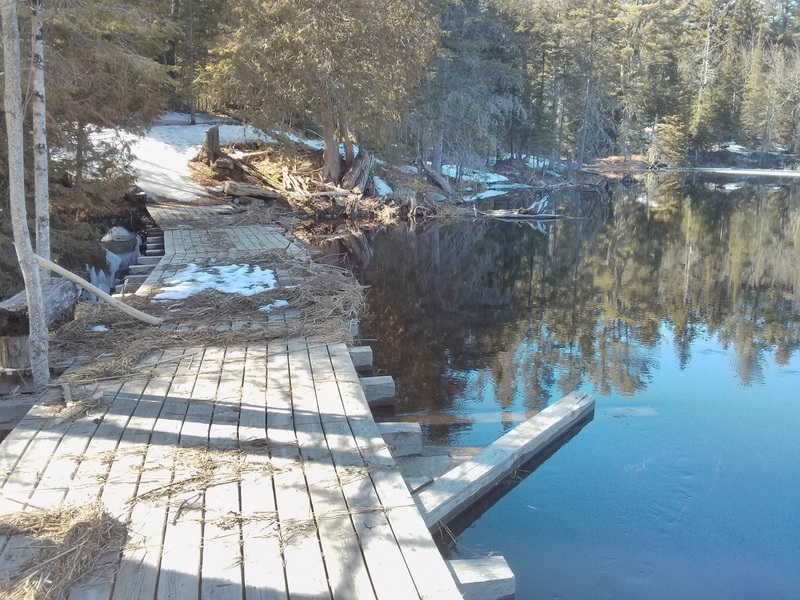 That’s why we close up for the season and don’t open up again as an Algonquin Park tourist lodge until mid May. Another issue with flooding is the spring run off. Every year water levels get high as the snow melts and collects in the streams and rivers. Every year we get flooding. But it is expected, and usually not to bad, other than a few years ago when there was massive damage to a lot of places and the town of Bancroft was flooded! This year it look like we got off lucky. A week of warm weather and some rain started the snow melt and water levels in Algonquin Park quickly rose. But then it got cold again before the water could get really high. So we have a few sticks and grasses that need to be swept away, new logs that we’ll need to cut up and dispose of. But the flood was controlled and no damage to our waterfront. That’s the best we can hope for. Every spring!